Creates a customizable Proposal Document in Microsoft Word (.docx) format. The proposal Document contains information that make up a Quotation and a Bill Of Materials (BOM). Variables - Stored in a category named Common. Calculation Table - With the name given to the Document and BOM suffixed. Document generation is triggered in the Specification Flow by the Release Documents task. In DriveWorks Administrator open the Project the Document is to be added to and go to Stage4: Output Rules then Documents - Files and scroll down to Template. Click the Add button on the command bar. 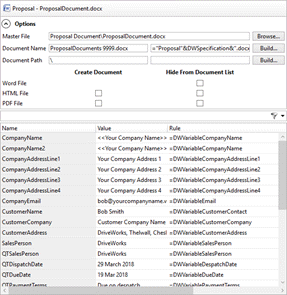 Choose the Proposal Document from the Document Templates list on the Add Document wizard. Give the new Document a name and click Finish. Once the Document has been added it will open in edit mode where various options and the parameters that hold the data can be driven. The Options can be minimized to allow more Document parameters in view. Click the arrow next to the Options heading to toggle between minimized and maximized mode. Master File - The location and name of the master file any new Document is created from. Document Name - The name that will be applied to the new Document. By default the rule given is <Document Name> & DWSpecification & ".docx"
The Document Name will need to be unique if all Documents are stored in the same location. Otherwise existing Documents will be overwritten. Document Path - The location the new Document will be stored. By default the rule given is blank, meaning it will be stored with the Specification. There are also options for creating HTML and PDF files. Along with the original .docx file that is created these files can be prevented from appearing in the Document List of the Specification Explorer. Check the box to Hide From Document List to not display the new Document in the Documents List for a Specification. The parameters that allow data to be driven into the document are listed below the options. The list of parameters can be filtered by using the Filter Box above the List. To learn how to use filters see How To Use Filters. Each parameter has a pre-defined rule applied. The rule is either the name of a Variable or a cell in the Calculation Table. Each parameter can have its pre-defined rule modified by selecting the parameter and clicking Build to launch the Rule Builder. However we recommend modifying the Variables or Calculation Table to get the required results. To modify the Variable - select the parameter and click the Build button from the command bar. When the Rule Builder opens, right click the Variable and select Edit Variable. To modify the Calculation Table cell - Note the cell reference to be modified and go to Stage 3: Data and Rules then Calculation Tables. Select the Calculation Table and edit the required cell.